We recently held a Father’s Day giveaway on our Greenbrier Real Estate Service Facebook page! The winner won ribeye steaks and shrimp, grill tool set, and a GRES ball cap. Be sure to find us on social media to stay up to date on all of our promotions as well as New Listings!, SOLD! properties, Price Updates!, and local information! Since it’s almost Summer we thought that we would share some great ways to spruce up your backyard for all those summer time BBQs and evenings enjoying the warm summer air! Let’s take a look at some great tips on creating the perfect getaway in your backyard! Make your deck a destination by defining different activity zones within the space. Multiple levels carve out spaces for dining and relaxing on this deck. A pergola covered with luxurious vines and an abundance of plants in containers bring the surrounding garden up onto the deck and help blend the structure into the landscape. A patio can be a hot slab of concrete baking in the sun–or it can be a welcoming extension of the house, calling you outdoors to enjoy cool breezes and fresh air. With a little planning, you can make your patio a comfortable seasonal room. Patios are usually surfaced with brick or stone. If you opt for concrete, consider adding texture and color to imitate stone for a more natural look. Design the patio to be an extension of your home’s architecture, and use planting beds, container gardens, and weatherproof furniture to decorate the outdoor space. If you grill at least twice a week from spring through fall and if you love eating outdoors, you need an outdoor kitchen. You don’t need a fancy grill, but a counter top for food prep and conveniences such as closed storage and a separate side burner will greatly enhance your outdoor cooking experience. Add a refrigerator and sink to make preparation and cleanup even easier. 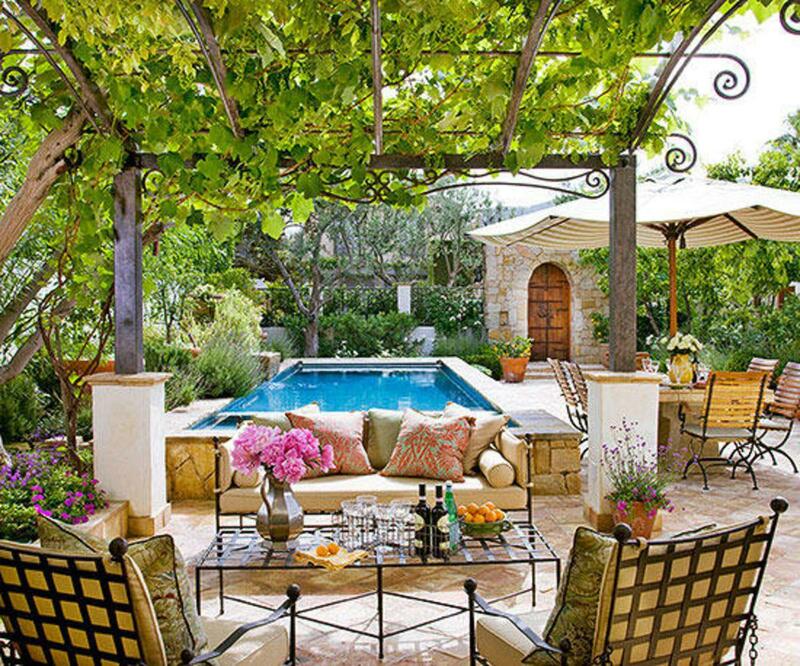 Your outdoor room will feel more like an oasis if it has a sense of enclosure. Fences and garden walls ensure privacy for patios, but you can also use lattice, pergolas, and landscaping to define outdoor spaces and screen views of neighboring houses. Even sun worshippers welcome a little shade. You’ll enjoy your deck or patio more if you can provide relief from the sun. Choices for providing shade include mature trees, umbrellas, retractable awnings, or even pergolas and arbors planted with vines. You have more choices than ever when it comes to furnishing your outdoor rooms. Wrought iron and cast iron, wrought or cast aluminum, and traditional wood are classic options. New synthetic, weatherproof patio furniture and fabrics are also now available, offering the same style and comfort as anything you would have inside your home. There are even weatherproof floor lamps and table lamps that match their indoor cousins for stylish good looks. A gazebo adds another level of luxury to your outdoor oasis. Whether attached to the deck, set near a pool, or planted in the landscape, a gazebo is an outdoor room in its own right and offers a protected spot for dining, cooking, or relaxing. Pergolas, trellises, and arbors can also be used to define activity zones in your backyard paradise. Use them to create focal points, separate areas according to function, or provide transitions from one area to another. For long, relaxing soaks at the end of the day, a hot tub or spa out on the deck is a must-have luxury. To determine the best location for the spa, consider privacy, access to the house, and whether you want the tub in sunshine or shade. A typical round hot tub is 6 feet in diameter and takes up about 30 square feet. A rectangular tub requires about 48 square feet. You’ll also need additional room for sitting and walking around the tub. Bear in mind that a hot tub full of water may weigh 2 tons, so it will need a foundation independent of the deck’s foundation. To enjoy your backyard getaway after the sun sets, include outdoor lighting. At its most basic, this consists of porch lights that illuminate access to the house and provide ambient lighting. For outdoor kitchens, you’ll need good task lighting over the grill and work areas. For the dining and conversation areas, candlelight, wallmount downlights, or dimmable electric lamps create a relaxed mood. Steps and walkways should be illuminated for safety. You can also use solar-powered accent lights or low-voltage lights to add drama and interest to the landscape and to highlight paths. Combine a mix of lighting sources to make your backyard getaway a magical place after dark. Fountains, fireplaces, and fire pits enhance the beauty and usefulness of your outdoor rooms. Fireplaces make a natural focal point and can help define space and provide privacy for an outdoor room. They’re also a starting point for an outdoor kitchen. Finally, accessorize your outdoor rooms with garden statuary, weatherproof art (such as plates, garden plaques, or decorative wrought iron), and pillows covered in weatherproof fabrics. These touches will turn an ordinary patio or deck into a welcoming, personal space for outdoor living. Article Credit to Better Homes & Garden website. For all your real estate needs, contact us! We would love to have our team of dedicated professionals work for you! Located in Lewisburg, WV serving the Greenbrier Valley and surrounding areas!